A balanced diet is “a diet which consists of a variety of different types of food and also provides adequate amounts of the nutrients that necessary for good health.” Following a balanced diet is important for us to keep body healthy and fit. In Holy Quran, Allah Almighty gives the divine order to people about food that is to eat the lawful foods which Allah (SWT) had created for them. He says: “O you who believe! Eat of the lawful things that we have provided you with, and be grateful to Allah, if it is indeed He Whom you worship” (Quran, 2:172). Islam teaches us that we should eat a balanced diet which can help us to stay healthy. 1) DATES- Holy Prophet (SAW) loved to eat dates. Dates are free from cholesterol to contain low fat. Good source of vitamin-A, dietary fiber, potassium, calcium, and vitamin-B6. 2) HONEY - Prophet Muhammad (SAW) said. “Honey is the cure for every stomach disease”. He (SAW) used to drink honey and water in the morning. Honey is the food of foods, drink of drinks and drug of drugs. It is used for improving appetite, strengthening the stomach, eliminating phlegm; as a meat preservative, hair conditioner, eye soother, and mouthwash. 3) MILK - Milk strengthens the back, renews vision and improves memory aside from providing calcium for teeth and bones. 4) VINEGAR - Prophet Muhammad (SAW) called Vinegar the best curry. It is healthy and makes for great salad dressings. Vinegar also helps fatigued muscles recover after exhausting physical activity. 5) OLIVES - Olive is also mentioned in Holy Quran. Prophet Muhammad (SAW) said: “Eat the olive oil and apply it (locally), since there is a cure for seventy diseases in it, one of them is Leprosy”. Olives are known to be the food of Prophets. Olive oil is an excellent treatment for skin and hair. It delays old age and treats inflammation of the stomach. FIGS - Figs are low in calories and good for bones. They are also known as one of the fruits of Paradise and offer various health benefits, nutrients, and anti-oxidants. GRAPES - The Prophet (SAW) was very fond of grapes. They are useful in purifying the blood, provide health, strengthen the kidneys and clear the bowels due to their high fiber content. In short, the importance of healthy eating, a balanced diet can be understood in the light of the Quran and Sunnah of Holy Prophet (PBUH). 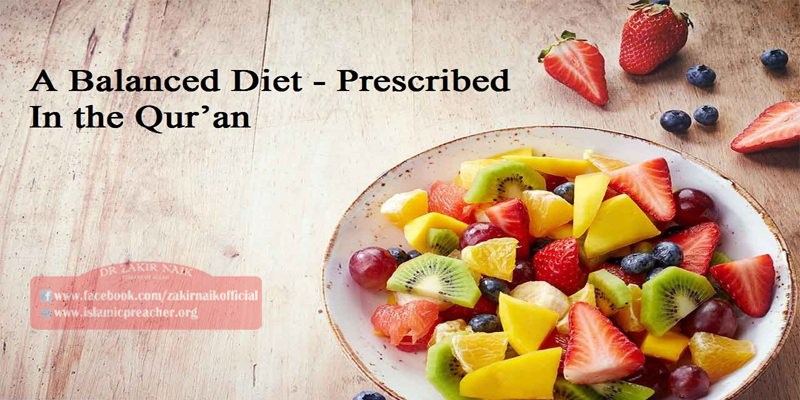 Islam has stressed the importance of balanced diet or healthy diet right from the start. Foods mentioned in Holy Quran are a good source of nutrition and considered a key to good healthy life. Being a Muslim we should adopt these above-mentioned things related to balanced diet and also encourage our children to adopt them.